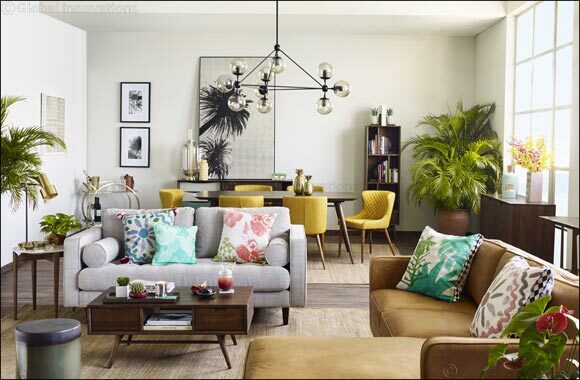 Dubai, UAE– March 11, 2017: Indigo Living, an upscale home furnishing retail outlet in the UAE launched its season-inspired Spring / Summer Collection 2017 for the soon to come warmer months. The collection features four distinctive styles that celebrates elegance and comfort - Pretty in Pink; Urban Chic; Caribbean Easy and Beach class. A play on fabrics and textures are key to capturing the energy and inspiration of this trend. The latest collection breathes youthfulness, playfulness and freshness in every piece empowering beauty in all forms. Pretty in Pink: The dusty pinks, elegant silhouettes and muted florals of the Pretty in Pink trend give classic feminine interiors a contemporary lift in a look that celebrates spring in spectacular style. Balancing tactile, layered textiles with reflective metallic and vintage finishes, this original aesthetic simultaneously evokes elements of futurism and heritage. Urban Chic: The urban chic collection echoes curiosity, culture and contemporary styling featuring neutral palette of creams, beige and tan browns that will compliment your look of a traveller exploring new escapades. Using organic materials such as marble and ceramic, this collection gives a feeling of relaxation from the city rush. Beach Class: Light, bright and uplifting furniture and home accessories are inspired by the coastal living look; allowing an escape to the everyday monotony. Cool creams, natural materials and earthy tones are touched with graphic textures, dark wood, leather, and nickel finishes for an aesthetic that combines both contemporary and classic design elements in a fresh interior. Caribbean Easy: This look is about embracing the warmth of summer for the more laid back customers. Rich pigments and vibrant hues bring the Caribbean vibe of this collection to life. Curios, accessories and metallic touches are a highlight of this look.